I am Gyan Ranjan and you are in my blog Gyan Ranjan Cricket, India news, learn vs earn, now about to know Cricket live score of Bangladesh vs West Indies 1st ODI match. Bangladesh lost his 1st wicket of Anamul Haque in very 2nd over of the inning. He didn't score even a single run. After losing the 1st wicket Tamim Iqbal and Shakib Al Hasan played the great inning and did a partnership over 200 runs for the 2nd wicket Shakib Al Hasan lost his wicket 3 runs short to his century. He scored 97 off 121 with the help of 6 boundaries. Tamim Iqbal got his century and scored 130 off 160 in which he smashed 10 4s and 3 6s. M Rahim played a blasting inning of 30 off 11 delivery in which he struck 3 4s and 2 6s. D Bishoo 2, Russel and J Holder got the 1-1 wicket. Bangladesh scored 279/4 in this Bangladesh vs West Indies 1st ODI match. No one players of West Indies could play long inning except Shimron Hatmyer who scored 52 off 78 with the help of 5 4s. Chris Gyle also played an inning of 40 off 60 in which he smashed 1 4s and 2 6s, but this kind of performance was not enough to win this Bangladesh vs West Indies 1st ODI match. Alzari Joseph 29, Devendra Bishoo 29, Jason Holder 17, Even Lewis 17, Andrew Russel 13, and Jason Mohammad could score only 10 runs. Bowlers of Bangladesh did a great job and stopped West Indies at 231/9. M Mortaza got 4 wickets in this match and has given only 37 runs. M Rahman also bowled well and 2 wickets for 35 runs. 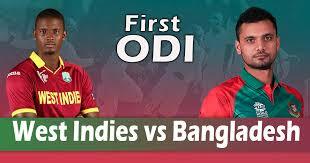 Mehdi Hasan and Rubel Hossain got 1-1 wickets in this Bangladesh vs West Indies 1st ODI. West Indies could score only 231 runs in 50 overs for the loss of 9 wickets and lost this 1st ODI by 48 runs. Bangladeshi batsman gave a slow but strong start to for the team and did over 200 runs partnership for the 2nd wicket between Tamim Iqbal 130, and Shakib Al Hasan 97. In the last 4 overs of the inning M Rahim 30 off 11, and Tamim Iqbal scored very fast, smashed boundaries and sixes to reach a good total 279/4. Bowlers of Bangladesh also bowled very well and stopped West Indies at 231/9 in 50 overs and won this Bangladesh vs West Indies 1st ODI by 48 runs. Thanks for coming and read this article. Must come again to my blog Gyan Ranjan, Cricket, India news, learn vs earn, for Cricket live score of other matches. This area covers all the news relating to Sports/managed beguilements and exercises on both neighborhood and general level including cricket restores, Pakistan Super League (PSL), football plot, tennis exchange, Hockey Champions Trophy, et cetera. Information is very informative also you get same from Nexter, this is the great resource to get such type of information about Tech news.